The MULCH MACHINE is the cadilac of weed barrier machines! You can take it from tilled soil to mowed sod with little adjusting. 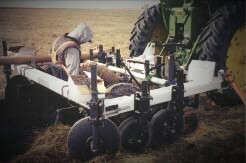 It is equipped with a plow to make a square trench that allows the weed barrier tighten as the dirt settles. This helps to keep the weed barrier on the ground and not blowing away in the wind! The quick release roll holder bracket makes changing barrier rolls a snap. Along with the hold down wheels, the MULCH MACHINE has a brake system for the barrier roll. 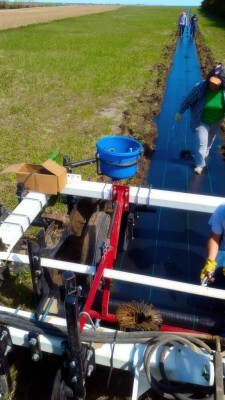 This allows the weed barrier to be installed in windy conditions. 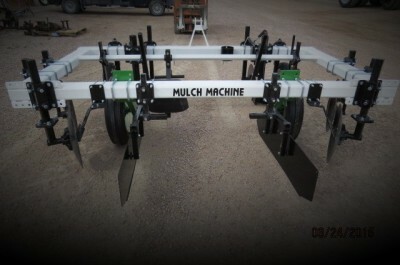 The MULCH MACHINE is also equipped with rear shields that keep the dirt off the center of the weed barrier. Your rows will be left nice and clean, as seen in this Nebraska Sandhills shelterbelt. With the MULCH MACHINE you are on your way to a WORRY FREE shelter belt. 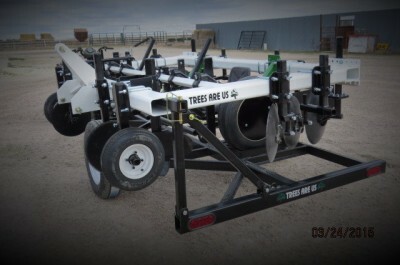 Dont forget to get your TREES ARE US TP 2000+ for your no worry tree planting! NOW comes with floating center link! 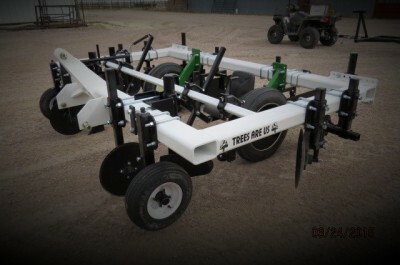 With the optional specialty trailer, you can haul your MULCH MACHINE with ease!